The Armenian Church remembers St. Mesrop (together with St. Sahak), twice each year, first in July and then again on the Feast of the Holy Translators in October; February 17 in the Roman Catholic Church. Mesrop Mashtots listen (help·info) (Armenian: Մեսրոպ Մաշտոց Mesrop Maštoc'; Eastern Armenian: [mɛsˈɾop maʃˈtotsʰ]; Western Armenian: [mɛsˈɾob maʃˈdotsʰ]; Latin: Mesrobes Mastosius; 362 – February 17, 440 AD), also known as Mesrob the Vartabed, was an early medieval Armenian linguist, composer, theologian, statesman and hymnologist. He is best known for inventing the Armenian alphabet c. 405 AD, which was a fundamental step in strengthening Armenian national identity. 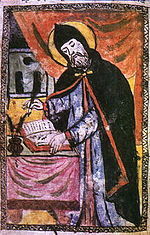 He was also the creator of the Caucasian Albanian and Georgian alphabets, according to a number of scholars and contemporaneous Armenian sources. Mesrop Mashtots, by the Venetian painter Giovanni Battista Tiepolo (1696-1770). Fresco at Würzburg Residence in Bavaria. Mesrop Mashtots was born in a noble family ("from the house of an azat" according to Anania Shirakatsi) in the settlement of Hatsekats in Taron (identified as the village of Hac'ik in the Mush plain), and died in Vagharshapat. He was the son of a man named Vardan. Koryun, his pupil and biographer, tells us that Mashtots (in his work he does not mention the name Mesrop) received a good education, and was versed in the Greek and Persian languages. On account of his piety and learning Mesrop was appointed secretary to King Khosrov IV. His duty was to write in Greek and Persian characters the decrees and edicts of the sovereign. Leaving the court for the service of God, he took holy orders, and withdrew to a monastery with a few chosen companions. There, says Koryun, he practiced great austerities, enduring hunger and thirst, cold and poverty. He lived on vegetables, wore a hair shirt, slept upon the ground, and often spent whole nights in prayer and the study of the Holy Scriptures. This life he continued for a few years. Armenia, so long the battle-ground of Romans and Persians, lost its independence in 387, and was divided between the Byzantine Empire and Persia, about four-fifths being given to the latter. Western Armenia was governed by Byzantine generals, while an Armenian king ruled, but only as feudatory, over Persian Armenia. The Church was naturally influenced by these violent political changes, although the loss of civil independence and the partition of the land could not destroy its organization or subdue its spirit. Persecution only quickened it into greater activity, and had the effect of bringing the clergy, the nobles, and the common people closer together. The principal events of this period are the invention of the Armenian alphabet, the revision of the liturgy, the creation of an ecclesiastical and national literature, and the readjustment of hierarchical relations. Three men are prominently associated with this work: Mesrop, Patriarch Isaac, and King Vramshapuh, who succeeded his brother Khosrov IV in 389. In 394, with the help of blessing of Armenia's Catholicos, Sahak Partev, Mesrop set out on a mission of spreading the word of God to a pagan or semi-pagan people. Mesrop, as noted, had spent some time in a monastery preparing for a missionary life. With the support of Prince Shampith, he preached the Gospel in the district of Goghtn near the river Araxes, converting many heretics and pagans. However, he experienced great difficulty in instructing the people, for the Armenians had no alphabet of their own, instead using Greek, Persian, and Syriac scripts, none of which were well suited for representing the many complex sounds of their native tongue. Again, the Holy Scriptures and the liturgy, being written in Syriac, were, to a large extent, unintelligible to the faithful. Hence the constant need of translators and interpreters to explain the Word of God to the people. Mesrop, desirous to remedy this state of things, resolved to invent a national alphabet, in which undertaking Isaac and King Vramshapuh promised to assist him. It is hard to determine exactly what part Mesrop had in the fixing of the new alphabet. According to his Armenian biographers, he consulted Daniel, a bishop of Mesopotamia, and Rufinus, a monk of Samosata, on the matter. With their help and that of Isaac and the king, he was able to give a definite form to the alphabet, which he probably adapted from the Greek. Others, like Lenormant, think it derived from the Avestan. Mesrop's alphabet consisted of thirty-six letters; two more (long O and F) were added in the twelfth century. 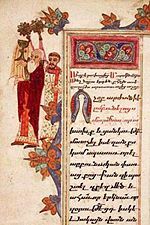 Medieval Armenian sources also claim that Mashtots invented the Georgian and Caucasian Albanian alphabets around the same time. However, most scholars link the creation of the Georgian script to the process of Christianization of Iberia, a core Georgian kingdom of Kartli. The alphabet was therefore most probably created between the conversion of Iberia under King Mirian III (326 or 337) and the Bir el Qutt inscriptions of 430, contemporaneously with the Armenian alphabet. Čanačʿel zimastutʿiwn ew zxrat, imanal zbans hančaroy. — Book of Proverbs, 1:2. The Amaras Monastery in Artsakh, where Mesrop Mashtots established the first-ever Armenian school that used his script in the 5th century. The invention of the alphabet in 405 was the beginning of Armenian literature, and proved a powerful factor in the upbuilding of the national spirit. "The result of the work of Isaac and Mesrop", says St. Martin, "was to separate for ever the Armenians from the other peoples of the East, to make of them a distinct nation, and to strengthen them in the Christian Faith by forbidding or rendering profane all the foreign alphabetic scripts which were employed for transcribing the books of the heathens and of the followers of Zoroaster. To Mesrop we owe the preservation of the language and literature of Armenia; but for his work, the people would have been absorbed by the Persians and Syrians, and would have disappeared like so many nations of the East". Anxious that others should profit by his discovery, and encouraged by the patriarch and the king, Mesrop founded numerous schools in different parts of the country, in which the youth were taught the new alphabet. It is historically proven, that Saint Mesrop himself taught in Amaras monastery of Artskah region of Armenia (located in contemporary Martuni region of unrecognized Nagorno-Karabakh Republic). But his activity was not confined to Eastern Armenia. Provided with letters from Isaac he went to Constantinople and obtained from the Emperor Theodosius the Younger permission to preach and teach in his Armenian possessions. Having returned to Eastern Armenia to report on his missions to the patriarch, his first thought was to provide a religious literature for his countrymen. Having gathered around him numerous disciples, he sent some to Edessa, Constantinople, Athens, Antioch, Alexandria, and other centres of learning, to study the Greek language and bring back the masterpieces of Greek literature. The most famous of his pupils were John of Egheghiatz, Joseph of Baghin, Yeznik, Koryun, Moses of Chorene, and John Mandakuni. The first monument of this Armenian literature is the version of the Holy Scriptures. Isaac, says Moses of Chorene, made a translation of the Bible from the Syriac text about 411. This work must have been considered imperfect, for soon afterwards John of Egheghiatz and Joseph of Baghin were sent to Edessa to translate the Scriptures. They journeyed as far as Constantinople, and brought back with them authentic copies of the Greek text. With the help of other copies obtained from Alexandria the Bible was translated again from the Greek according to the text of the Septuagint and Origen's Hexapla. This version, now in use in the Armenian Church, was completed about 434. Gravesite of Mesrop Mashtots. The inventor of the Armenian alphabet. The decrees of the first three councils — Nicæa, Constantinople, and Ephesus — and the national liturgy (so far written in Syriac) were also translated into Armenian, the latter being revised on the liturgy of St. Basil, though retaining characteristics of its own. Many works of the Greek Fathers also passed into Armenian. The loss of the Greek originals has given some of these versions a special importance; thus, the second part of Eusebius's Chronicle, of which only a few fragments exist in the Greek, has been preserved entirely in Armenian. In the midst of his literary labors Mesrop revisited the districts he had evangelized in his earlier years, and, after the death of Isaac in 440, looked after the spiritual administration of the patriarchate. He survived his friend and master by only six months. The Armenians read his name in the Canon of the Liturgy, and celebrate his memory on 19 February. Saint Mashtots is buried at a chapel in Oshakan, a historical village 8 km (5.0 miles) southwest from the town of Ashtarak. 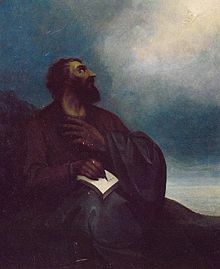 Saint Mesrop is listed officially in the Roman Martyrology of the Roman Catholic Church; his feast day is February 17. Virtually every town in Armenia has a street named after Mashtots. In Yerevan, Mashtots Street is one of the most important in the city center, which was previously known as Lenin Street (Lenin Prospect). 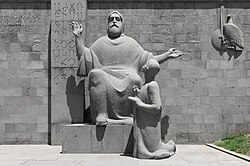 There is a statue to him at the Matenadaran, one at the church he was buried at in Oshakan village, and one at the monument to the alphabet found on the skirts of Mt. Aragats north of Ohanavan Village. Stamps have been issued with his image by both the Soviet Union and by post-Soviet Armenia. The Order of St. Mesrop Mashtots, established in 1993, is awarded for significant achievements in economic development of the Republic of Armenia or for accomplishments, such as in science, culture, education or public service, and for activities promoting those fields. Mashtots also produced a number of liturgical compositions. Some of the works attributed to him are: «Մեղայ քեզ Տէր» (Meġay k’ez Tēr, “Miserere to you, Lord”), «Ողորմեա ինձ Աստուած» (Voġormea inj Astuac, “Have mercy of me, God”), «Անկանիմ առաջի քո» (Ankanim aṙaǰi k’o, “I kneel before you”) and «Ողորմեա» (Voġormea, “Miserere”), all of which are hymns of repentance. Yuzbashyan, Karen. "L'invention de l'alphabet arménien: de langue parlée á la langue écrite." Revue des Études Arméniennes. 33 (2011), pp. 67–129. Wikimedia Commons has media related to Saint Mesrob. ^ Hacikyan, Agop Jack; Basmajian, Gabriel; Franchuk, Edward S.; Ouzounian, Nourhan (2000). The Heritage of Armenian Literature: From the Oral Tradition to the Golden Age. Detroit: Wayne State University Press. p. 91. ISBN 9780814328156. ^ Rayfield, Donald (2000). The Literature of Georgia : A History (2nd rev. ed.). Surrey: Curzon Press. p. 19. ISBN 0700711635. ^ Grenoble, Lenore A. (2003). Language policy in the Soviet Union. Dordrecht [u.a. ]: Kluwer Acad. Publ. p. 116. ISBN 1402012985. ^ Bowersock, G.W. ; Brown, Peter; editors, Oleg Grabar, (1999). Late antiquity : a guide to the postclassical world (2nd ed.). Cambridge, Mass. : Belknap Press of Harvard Univ. Press. p. 289. ISBN 0-674-51173-5. ^ a b Koryun The Life of Mashtots, translation into Russian and intro by Sh.V.Smbghaatyan and K.A.Melik-Oghajanyan, Moscow, 1962. ^ J. M. Thierry, "Notes de géographie historique sur le Vaspurakan", REByz 1976 vol34. ^ Histoire du Bas-Empire de Lebeau, V, 320. This article incorporates text from a publication now in the public domain: Vaschalde, A. A. (1911). "Mesrob" . In Herbermann, Charles (ed.). Catholic Encyclopedia. 10. New York: Robert Appleton. This page was last edited on 13 April 2019, at 12:24 (UTC).